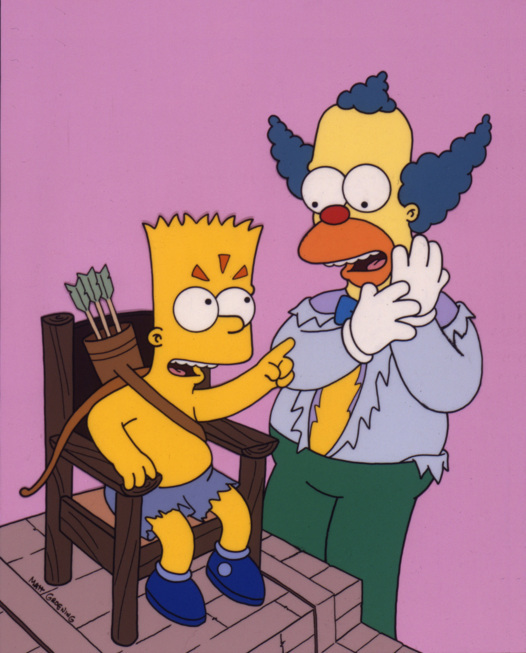 The fourth season began on September 24, 1992 with the first episode, "Kamp Krusty," and ended on May 13, 1993 with "Krusty Gets Kancelled." Al Jean and Mike Reiss were the show runners of the season, as they also were for the previous season. This was the first time the producers did not submit episodes for the "Primetime Emmy Award for Outstanding Animated Program (for Programming Less Than One Hour) award. By 1993, animated TV series were allowed to be nominated for Outstanding Comedy Series, whereas previously the series could only be nominated for animated awards. "A Streetcar Named Marge" and "Mr. Plow" were submitted by producers, but neither had a nomination as voters deemed it unsuitable to have animation nominated alongside live action TV series. Nonetheless, the season was nominated for 6 awards and won an Emmy Award for "Outstanding Voice-Over Performance" by Dan Castellaneta in "Mr. 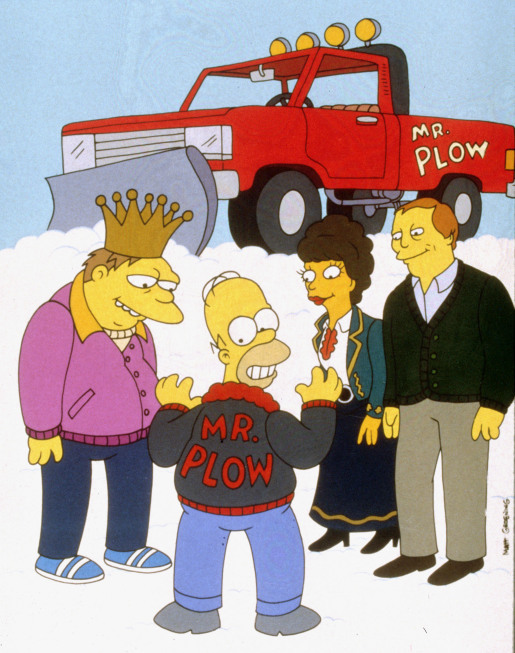 Plow"; an Annie Award for "Best Animated Television Program"; a Genesis Award for "Best Television Prime Time Animated Series" for "Whacking Day"; and a Saturn Award for "Best Television Series." 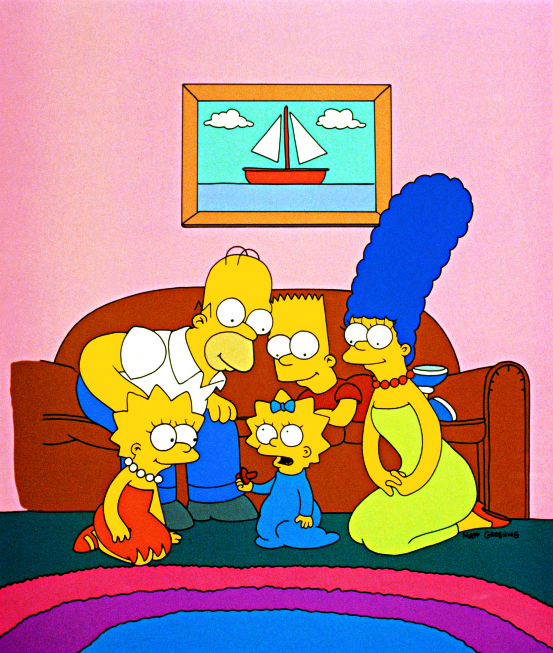 Season 4 also marked the first attempt of a Simpsons feature-length film. James L. Brooks suggested the script for "Kamp Krusty" as a possible movie idea. However, due to problems with making the story long enough for an 80-minute film, the idea was dropped. It would not be until over 14 years later that a Simpsons film would finally be made in a form of The Simpsons Movie, which was released on July 27, 2007 worldwide. All 22 episodes of Season 4, including extras, were released on DVD on June 15, 2004 in Region 1, August 2, 2004 in Region 2 and August 25, 2004 in Region 4. The fourth season was executively produced by Al Jean and Mike Reiss, who also were showrunners of the previous season. Some of The Simpsons' original writers, dubbed as the "original team" as they had been writing for the show since the first season, had left after the completion of "Cape Feare", which was the final episode made in Season 4 though aired in the following season as a hold-over episode. Jay Kogen, Wallace Wolodarsky, Sam Simon,Jeff Martin, David M. Stern and Jon Vitti left The Simpsons following the season though the latter two returned to write more episodes. After their role as showrunners of The Simpsons ended in Season 4, Jean and Reiss left to produce their own animated series, The Critic. Director Rich Moore also left to work on Jean and Reiss' show. The former Simpsons staff eventually returned to work on The Simpsons after the failure of The Critic. Jean and Reiss returned to write more Simpsons episodes, with the former becoming showrunner since Season 13. And Moore returning years later to assist the animation of The Simpsons Movie George Meyer and John Swartzwelder remained while Conan O'Brien, Frank Mula and future show runners Bill Oakley and Josh Weinstein received their first writing credits. 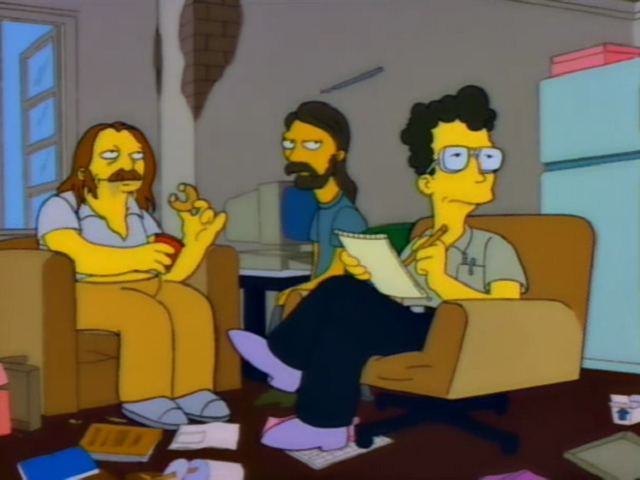 One-time writers for the season include Adam I. Lapidus, Gary Apple and Michael Carrington, the latter who returned to voice characters in "Simpson Tide" and "Million-Dollar Abie". Season 4 was also the conception of a feature length Simpsons film. The Simpsons' creator, Matt Groening, intended for a film to be made after the show ended although came to deny this when he commented, "but that [The Simpsons] was undone by good ratings". 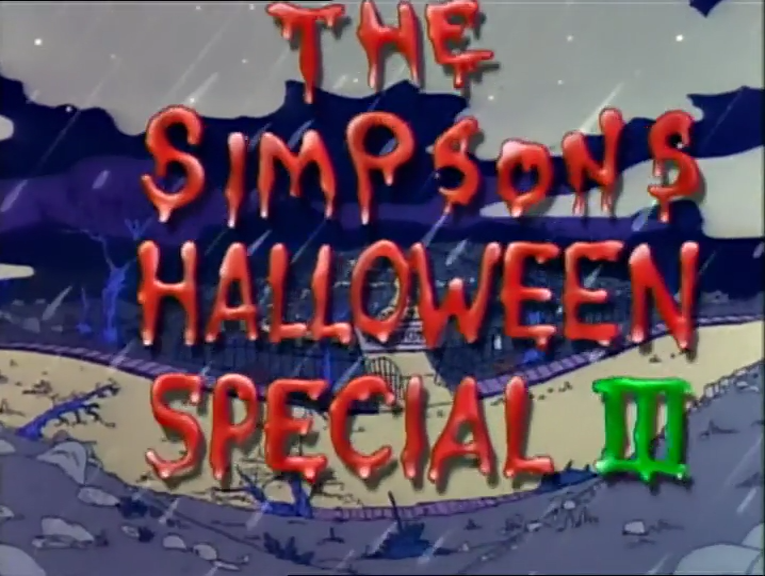 The season's premiere and Season 3 hold-over, "Kamp Krusty", was attempted to be adapted into a film but was scrapped when the producers were unable to make the episode to a suitable length of a feature length film, which tends to be 80 minutes minimum while it was 18 minutes as stated. This was the final season that had episodes animated by Klasky Csupo, where the studio also animated The Simpsons shorts and the first three seasons of the show, including the two hold-over episodes of Season 4, "Kamp Krusty" and "A Streetcar Named Marge". The Simpsons would then be animated by Film Roman to this day. The children of Springfield, including Bart and Lisa, are excited about going to Kamp Krusty because the camp's ad promises they will get to spend the summer with Krusty the Clown. When they arrive, however, they find that conditions at the camp are deplorable, Krusty is nowhere to be found, and the camp is staffed by an uncaring director (Mr. Black) and the school bullies. When they try to pass off a bad impersonator (Barney Gumble in a clown wig) as the real Krusty, Bart has had enough. He leads a revolt where the children take over the camp, driving out Mr. Black and the bullies. Back at home, Homer and Marge are having a pleasant time without Bart and Lisa, with Homer gaining more hair and losing weight, until they learn of Bart's revolt on the TV news (Homer promptly loses his new hair and regains his weight). Krusty finally arrives at the camp and apologizes to the children. To make up for the terrible time they had, he takes them to Tijuana, Mexico. Marge auditions for the part of Blanche DuBois in a local musical production of A Streetcar Named Desire, directed by community theatre personality Llewellyn Sinclair. Homer, however, is completely unsupportive of Marge's effort. When Homer's apathy motivates Marge to channels her anger and resentment into her acting, she impresses Sinclair and wins the part. Marge forgives Homer, however, when he attends the play, is genuinely moved by the story, and recites some details of the plot, showing that he really was paying attention. Meanwhile, Maggie is sent to a strict daycare (run by Sinclair's sister) which takes away her and the other babies' pacifiers, and Maggie leads the babies in a revolt to get them back. Special Guest Voices: Phil Hartman as Lionel Hutz and Troy McClure; Jon Lovitz as Llewellyn Sinclair and Ms. Sinclair. One Sunday morning, Homer skips church and has what he considers to be the best day of his life. He then decides to quit church completely and forms his own religion, customized for himself. Marge, Ned Flanders, and Reverend Lovejoy try to talk Homer into coming back, but Homer refuses. However, the very next Sunday, Homer falls asleep and a lighted cigar sets the house on fire. 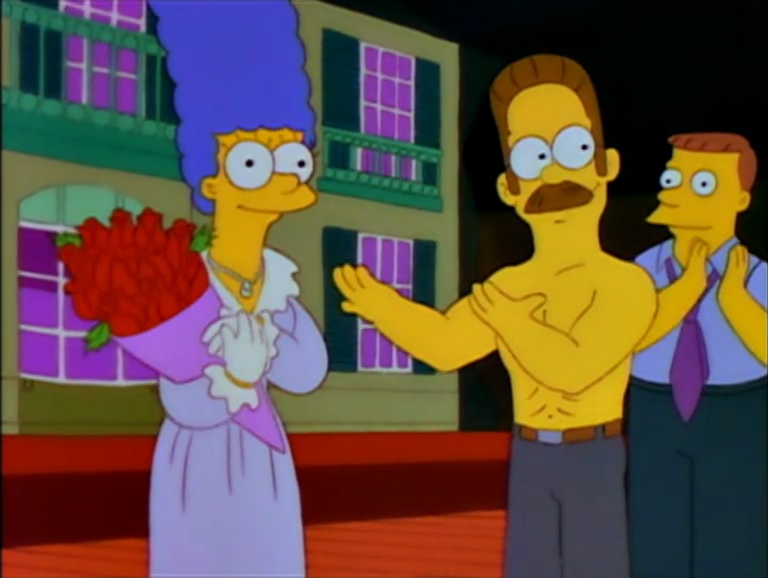 Flanders rescues Homer from the burning house, and the volunteer fire department puts out the fire. Reverend Lovejoy asks Homer to consider that the hand of God was working through his friends, saving him from the fire. Now convinced, Homer returns to church. Lisa feels that she is ugly after she sees a caricatured drawing of herself. To boost her confidence, Homer enters Lisa in the Little Miss Springfield beauty pageant. Lisa is reluctant to enter, particularly when she sees the competition she faces from seasoned pageant participant Amber Dempsey. However, Lisa does quite well, finishing in second place to Amber. Lisa then becomes Little Miss Springfield by default after Amber is hit by lightning and hospitalized for her injuries. Lisa enjoys the perks of her reign (among other things, going on a USO tour with Bob Hope) until she learns that she is expected to be a spokesperson for Laramie Cigarettes. Lisa then rebels, and the pageant officials dethrone her on a technicality. Although she loses her title, Lisa has her self-esteem restored and thanks Homer for caring about her. Special Guest Voices: Lona Williams as Amber Dempsey; Bob Hope as himself. 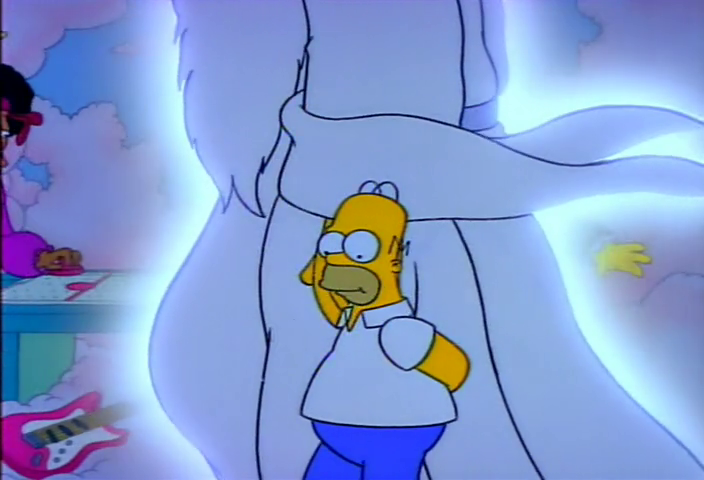 64 - 5 "Treehouse of Horror III"
"The Simpsons Halloween Special III"
Opening: Homer advises viewers that the following program is scary, then switches to taunting them and dares them to turn the TV off. A TV in the episode switches off, but Marge can be heard angrily asking Homer if he dared them, which he denies. Prologue: The Simpson family and several local children in their costumes gather in the Simpsons' living room for a Halloween party. Lisa, Grampa, and Bart each tell a scary story. Clown Without Pity: Homer has forgotten Bart's birthday, and as a last-minute gift buys him a Krusty the Clown doll in spite of the store clerk's warning that the doll is evil. Bart is happy with the gift, but (initially unknown to the rest of the family) the doll repeatedly tries to kill Homer. Marge learns that the doll has a good/evil switch and changes the switch from "evil" to "good", after which the doll becomes Homer's slave. King Homer: In a parody of King Kong, Mr. Burns hires Marge Bouvier to help him capture a mysterious large ape called King Homer. They capture him, take him back to New York City, and put him in a show. King Homer escapes, runs amok in the city, and abducts Marge. King Homer's rampage is short-lived, however, as he collapses from exhaustion, unable to climb even one story of the Empire State Building. King Homer is eventually married to Marge. Dial "Z" for Zombies: Bart discovers a book of magic and attempts to raise Lisa's cat Snowball I from the dead, but instead accidentally re-animates hundreds of corpses from the cemetery, unleashing a plague of zombies on Springfield. To set things right, Bart must return to the book and cast the correct spell to send the zombies back to their graves, all while the zombies relentlessly pursue him and the rest of the family. Bart's behavior is worse than ever, as Homer and Marge learn at Parents Night at Springfield Elementary. Homer warns Bart that he needs to improve his behavior, and Marge warns Homer that he needs to do better at punishing Bart and sticking to it. Bart is asked to watch Maggie, doesn't do it, and she crashes the family car. Homer has finally had enough, and he forbids Bart from seeing The Itchy & Scratchy Movie, which has just come out and all the children are eager to see it. Bart tries to change Homer's mind by comparing the movie to the Apollo 11 landing and asking how Homer would have felt if he had been forced to miss watching it on TV, but Homer is unmoved. Bart later tries to go to the movie on his own, but finds he has been banned (due to Homer having told the theatre to deny him entry). In spite of all his attempts, Bart misses the movie. However, it pays off when in a flash forward scene forty years into the future, Bart has become the Chief Justice of the Supreme Court, instead of a male stripper as Marge had feared. Special Guest Voice: Neil Armstrong as himself (via archived audio). The Simpson home is in dire need of foundation repairs, as one end of the house is sinking. Marge decides to get a job to help pay for them. She is hired on at Springfield Nuclear Power Plant, where she ends up working alongside Homer. Mr. Burns quickly becomes attracted to Marge and attempts to seduce her, but backs off when he sees how Homer stands up for her. Meanwhile, Bart repeatedly pretends to be ill to avoid taking a test. 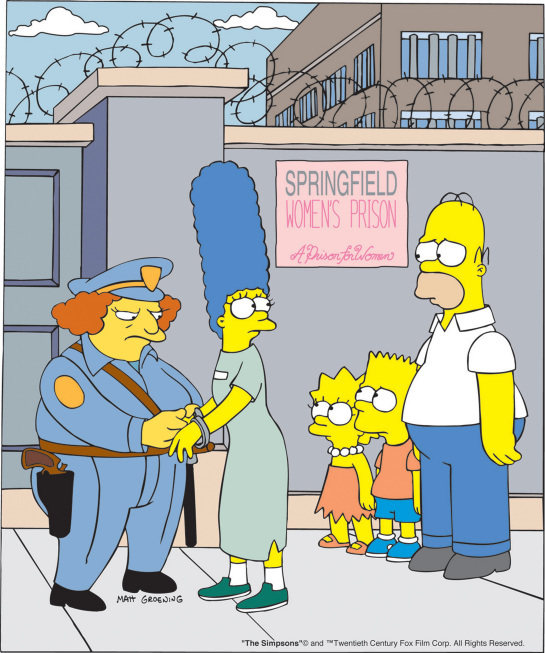 The Simpsons have new next-door neighbors: Ruth Powers and her daughter, Laura. Bart quickly develops a crush on Laura, but is heartbroken when she tells him that she is in love with Jimbo Jones. Bart pulls a prank which lets Laura see that Jimbo is no good for her, and she says that she would date Bart if he were a little older. Meanwhile, Homer clashes with a local seafood restaurant, "The Frying Dutchman," over the definition of their "all-you-can-eat" special. They end up in court, but reach a compromise: Homer can eat all he wants in exchange for the restaurant being allowed to exhibit him as a freak of nature. Homer wrecks both of the family cars during a blizzard, buys a snowplow, and goes into business by starting his own plowing service business, "Mr. Plow." Homer's business succeeds, but he ends up facing competition as Barney starts his own rival snowplow business, the "Plow King." Barney creates a winning advertising jingle (with Linda Ronstadt's help) and steals all of Homer's customers. The business competition puts a strain on Homer's and Barney's friendship, but they manage to resolve their conflict—just in time for the spring thaw. Marge tells the story of how the Simpson family moved to their house when Bart was a toddler and Marge was pregnant with Lisa. Homer was frustrated with Bart because he said all kinds of words, but not "Daddy"—instead, he called Homer by his first name. (Bart's first words had been "Ay, caramba!" when he walked in on Homer and Marge in the bedroom.) When Lisa was born, Bart took an instant dislike to her, but she won his heart when she learned to talk and her first word was "Bart." She quickly said several other words, but not "Daddy", to Homer's continued frustration. Back in the present, Marge finishes her story, and Bart and Lisa start arguing. Homer then puts Maggie to bed and says to her, "The sooner kids talk, the sooner they talk back. I hope you never say a word." After Homer leaves, Maggie takes her pacifier out of her mouth and, unheard by anyone else, says her own first word: "Daddy." Guest Voice: Elizabeth Taylor as Maggie. 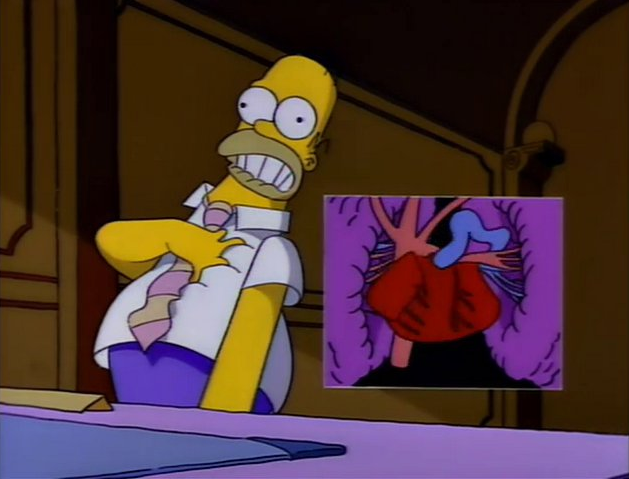 The effects of years of unhealthy eating combined with work-related stress finally catch up to Homer, and he has a heart attack. He needs a triple bypass, but the family can't afford the $40,000 that Dr. Hibbert says it will cost. The family seek help from cut-rate doctor Nick Riviera, who says he'll do the operation for $129.95. Homer chooses the cheaper operation. During the surgery, Dr. Nick doesn't know what to do next because the critical part of the instructional video he had watched to prepare was taped over. With some help from Lisa, Nick succeeds in finishing the operation and Homer makes a full recovery. Mr. Burns is fined three million dollars for illegally dumping nuclear waste, and a town meeting is held to decide how to spend the money. 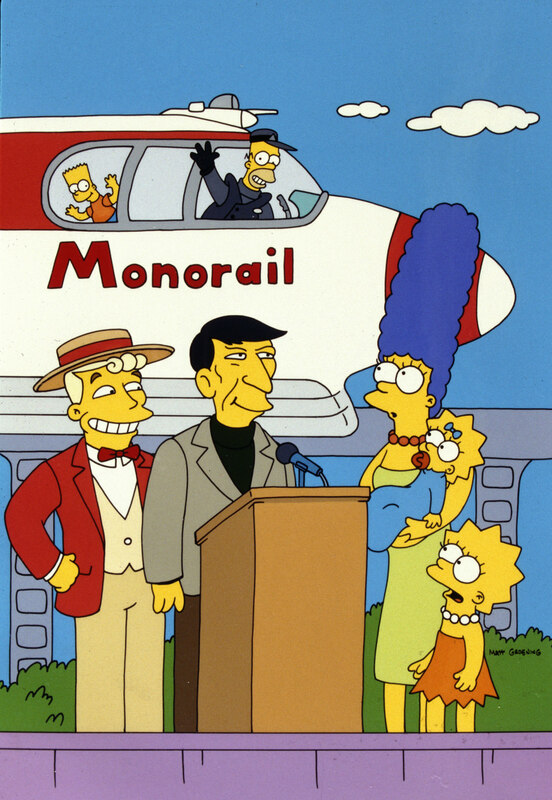 The people are about to adopt Marge's idea to repair Main Street, when a smooth-talking stranger named Lyle Lanley shows up and convinces them to buy a monorail, even though the town has no need for one. Suspicious, Marge travels to another town that bought Lanley's monorails and learns that Lanley is a con man and his monorails are all dangerous due to shoddy materials. Marge then quickly returns to Springfield, but is too late to stop the monorail from opening. The monorail's brakes fail and it speeds out of control. Fortunately, monorail conductor Homer manages to stop the train with an improvised anchor, saving the passengers. Marge's, Patty's, and Selma's Aunt Gladys passes away, and in her video will, Gladys admonishes Patty and Selma to raise families rather than die alone as she did. Selma takes the advice to heart, investigating and discarding several possibilities for having a child. Meanwhile, Homer gets food poisoning from eating a rotten sandwich, and it looks like a planned family trip to Duff Gardens will be postponed again (the first postponement was for Aunt Gladys's funeral). Marge asks Selma to take Bart and Lisa, and she agrees. At Duff Gardens, the children get into all kinds of trouble, causing Selma to think twice about having a child. As a substitute, she adopts Gladys's pet iguana, Jub-Jub, who had originally been willed to Selma's, Patty's, and Marge's mother Jacqueline. Fed up with Homer's neglect, Bart signs up with "Bigger Brothers", a mentor program, and is matched with a hip, cool, and caring young man named Tom. Homer finds out, and for revenge he joins Bigger Brothers as a mentor and is matched with an orphan boy named Pepe. When Homer and Tom finally meet, they get into a fight, Homer and Bart reconcile, and Tom takes Pepe under his wing. Meanwhile, Lisa struggles with an addiction to the 900-number hotline of a young celebrity named Corey, running up huge phone bills until she is caught and kicks her habit. 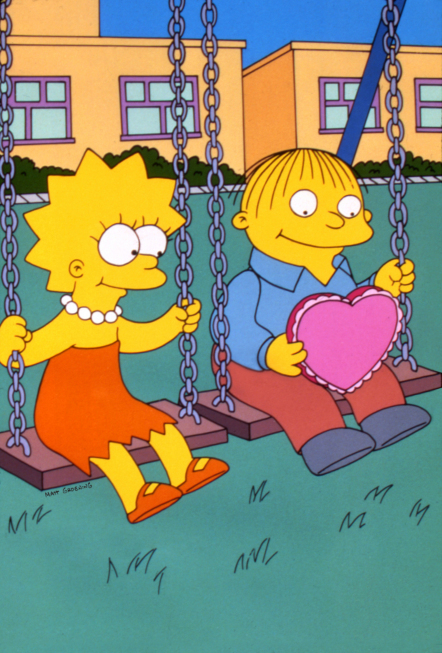 When Ralph doesn't get any cards for Valentine's Day, Lisa feels sorry for him and gives him a card to cheer him up. Ralph misinterprets the gesture and falls in love with Lisa, relentlessly pursuing her to the point of getting the two of them cast as George and Martha Washington in the Presidents' Day Pageant. 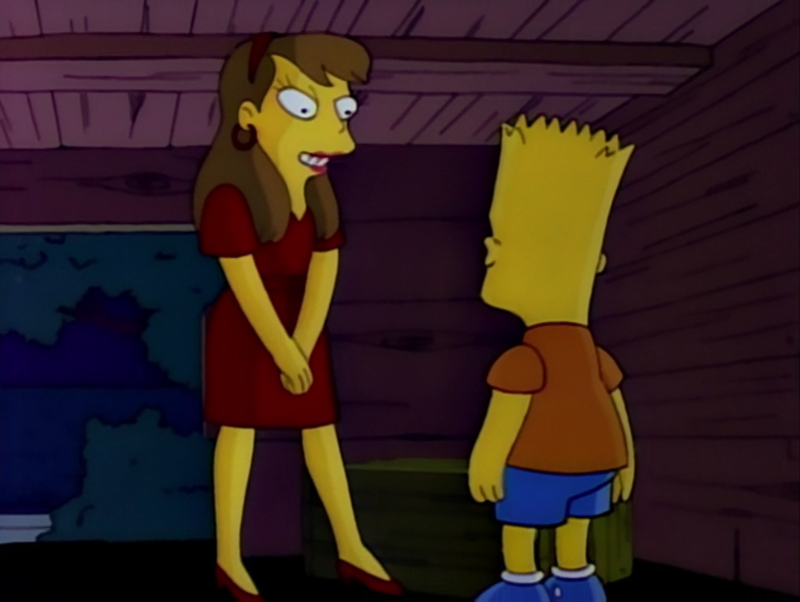 Eventually, Lisa tells Ralph (on live TV) that she was never interested in him and only gave him the card out of pity. Ralph is humiliated and heartbroken, but he gives a brilliant performance as George Washington, moving the audience (and Lisa) to tears. After the play, Ralph and Lisa agree to be friends. Homer is arrested for drunk driving, and his license is revoked and he is ordered to attend traffic school and Alcoholics Anonymous meetings. Marge persuades Homer to give up beer for a month, and the experience of living without beer gives him a whole new outlook on life. When the month is up, Homer is tempted to start drinking again, but passes up beer at Moe's Tavern in favor of bicycling with Marge. Meanwhile, Bart destroys Lisa's science fair project, a large genetically engineered tomato, and she replaces it with a project that compares the intelligence of Bart and a hamster. 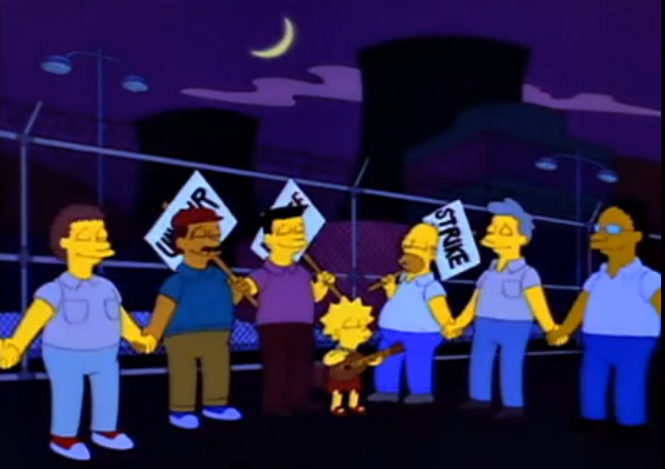 Springfield Nuclear Power Plant announces its intention to cancel the dental plan, and the Simpsons have just learned that Lisa needs braces. Homer realizes that he needs the plan to pay for Lisa's braces, and almost before he knows it, he finds himself leading the power plant employees' union in a strike to win back the dental plan. Lisa, meantime, is forced to wear cheap, but large and outdated, braces that look hideous. In spite of Homer's bumbling, Mr. Burns is convinced that Homer is a master negotiator, and a long standoff ensures, during which the plant uses tactics such as shutting off power to the entire town. Burns finally agrees to bring back the dental plan on the condition that Homer step down as union leader. Homer eagerly agrees and Lisa gets her new braces. For an April Fool's Day prank on Homer, Bart shakes a can of Duff Beer in a paint shaker, then leaves the beer in the refrigerator for Homer to find. 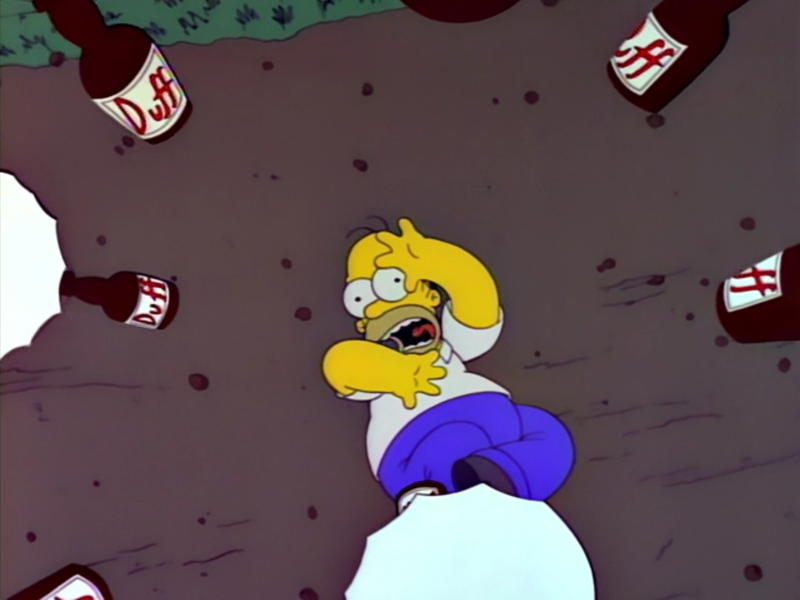 When Homer opens the beer, the resulting explosion blows the roof off the house and puts Homer into a coma. 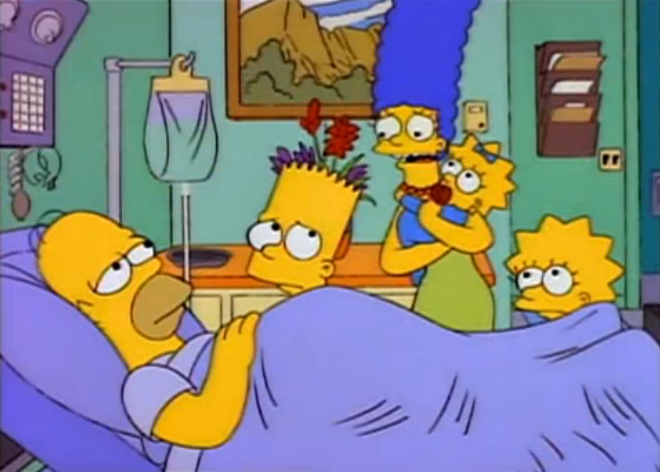 During his coma, the family reminisce by way of clips from previous episodes. Homer shows some signs of life during the stories, but when Bart confesses to the shaken beer prank, Homer immediately wakes up and begins strangling Bart. The rest of the family are glad to see that Homer has recovered. Disappointed with the quality of recent Itchy & Scratchy episodes, Bart and Lisa decide to write one of their own and submit it to Roger Meyers, CEO of the cartoon's studio. Meyers rejects their script out of hand because Bart and Lisa are children, thus (in his view) too young to be cartoon writers. Bart and Lisa re-submit the script under Grampa's name, and this time it is accepted. Grampa finds himself with a new job as an Itchy & Scratchy writer, with Bart and Lisa doing the creative work while Grampa gets the credit. The front falls through, however, when Grampa's writing wins him an award, he sees the cartoon for the first time, and in his acceptance speech he denounces violence in cartoons. Meanwhile, Homer and Marge attend their high school reunion and learn that Homer never officially graduated because he failed a science class. 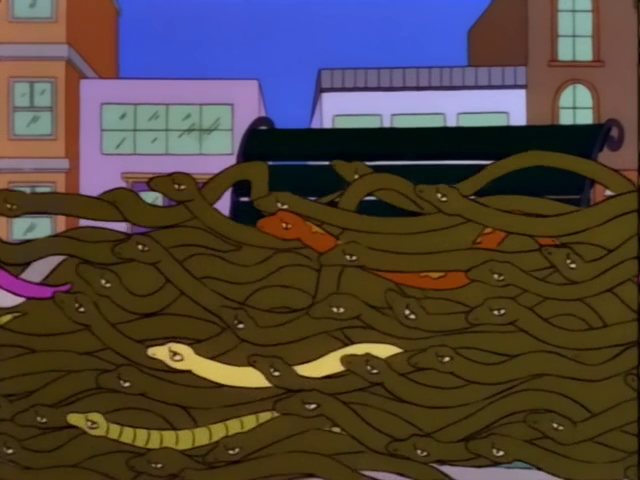 It's time for Whacking Day, a Springfield holiday where snakes are driven to the town square and beaten to death, a tradition dating back to town founder Jebediah Springfield. Lisa speaks out against the violence, but no one listens. Bart, who has become a serious student since being expelled from Springfield Elementary, discovers that Jebediah couldn't have started Whacking Day and learns that snakes are attracted to bass sounds. Lisa enlists the help of Barry White and his smooth bass singing voice to lure the snakes to the Simpson home where they'll be safe. The plan succeeds and Bart tells the town the truth about Whacking Day: It was actually invented in the 1920s as an excuse to beat up the Irish. The townspeople renounce the holiday, and Principal Skinner allows Bart to return to school. Marge accidentally takes an item from the Kwik-E-Mart without paying, and is sentenced to thirty days in prison for shoplifting. Her absence is felt at home, as the house turns into a total mess. Marge's absence also impacts the entire town, as without her marshmallow squares, a bake sale fails to raise enough money for the Springfield Parks Commission to buy a statue of Abraham Lincoln. Instead, the Commission gets a statue of Jimmy Carter, but the townspeople dislike it and a riot breaks out. To restore order, Mayor Quimby orders Marge to be released early, and everyone welcomes her back. A new children's TV program, featuring a ventriloquist's dummy named Gabbo and airing opposite the Krusty the Clown show, is an instant success. Krusty's show, meanwhile, declines in ratings and popularity and is soon cancelled. Bart and Lisa are uninmpressed with Gabbo and manage to record him on a live TV camera insulting the children of Springfield, creating a scandal which decreases Gabbo's popularity. Bart and Lisa then convince several of Krusty's celebrity friends (Bette Midler, Johnny Carson, Luke Perry, Hugh Hefner and the Red Hot Chili Peppers) to take part in a special comeback program for Krusty. The Krusty Comeback Special is very successful, and Krusty's show returns to the air. Season 4 was released on DVD in its entirety as The Complete Fourth Season on August 26, 2003 in Region 1, October 6, 2003 in Region 2 and October 22, 2003 in Region 4 by 20th Century Fox. While primarily containing the original 22 episodes, the boxset also consists on bonus features such as storyboards. "Itchy & Scratchy: The Movie"
"So It's Come to This: A Simpsons Clip Show"
This was the final association of Klasky Csupo with The Simpsons as it produced the Ullman shorts and Seasons 1-3. However, two holdover episodes from Season 3, "Kamp Krusty" and "A Streetcar Named Marge," were aired in the succeeding season, i.e., Season 4, with Season 3's production code, 8Fxx. Production then shifted to Film Roman, which produced episodes starting in Season 4. Film Roman's first Simpsons episode was "Homer the Heretic," as indicated by the first use of the production code 9Fxx. ↑ 1.0 1.1 Vitti, Jon. The Simpsons season 5 DVD commentary for the episode "Cape Feare" [DVD]. 20th Century Fox. ↑ Jean, Al. The Simpsons season 5 DVD commentary for the episode "Cape Feare" [DVD]. 20th Century Fox. ↑ Anderson, Mike B.; Dean Moore, Steven; Moore, Rich; Silverman, David. Audio Director's commentary [DVD]. 20th Century Fox. ↑ Carrington, Michael. The Simpsons season 4 DVD commentary for the episode "Cape Feare" [DVD]. 20th Century Fox. ↑ Jean, Al. The Simpsons The Complete Fourth Season DVD commentary for the episode "Kamp Krusty" [DVD]. 20th Century Fox. Modified on July 2, 2018, at 12:36.